The Moto Z3 Play is the next major release coming from Motorola. After revealing its new Moto G6 and E5 series, the US company plans to out something more consistent on the market, the Moto Z3 Play, a mid-range smartphone with a bit more power under its chassis than the phones Motorola introduced this year. Renders of the upcoming Moto Z3 Play leaked last month confirming the smartphone will feature dual rear cameras and a fingerprint sensor positioned on the side along with the power button. Now, a few live pictures of a prototype unit show a little bit more of what's to come. Motorola completely removed the home button and thinned the bezels considerably. The circular-shaped dual-camera on the back is perfectly visible, alongside the dual-tone LED flash and the Moto Mods connector. 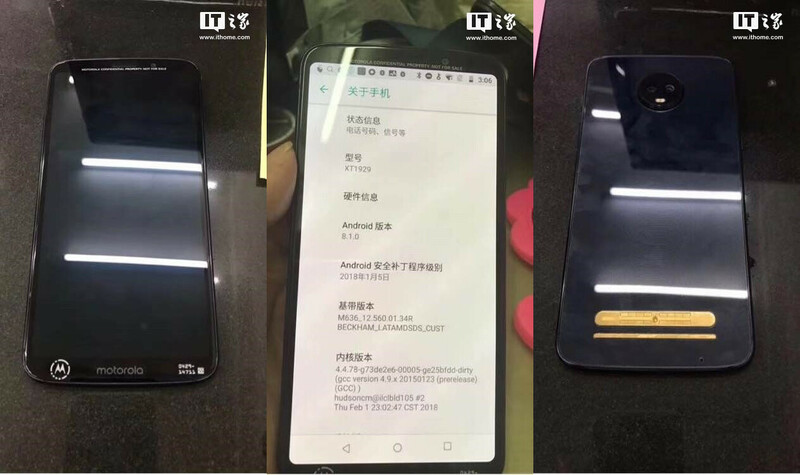 The smartphone is said to boast a large 6-inch display with FHD+ resolution (2160 x 1080 pixels) and a 3,000 mAh battery. Motorola has decided to include a Qualcomm Snapdragon 636 processor inside, coupled with either 3GB RAM and 32GB storage or 6GB RAM and 64GB internal memory. As seen in one of the pictures, the Moto Z3 Play runs Android 8.1.0 Oreo and even has the May security patch installed. The smartphone is expected to be revealed in June, but an exact date hasn't been announced yet. Wow! That is one nice looking Motorola device. The Z series is meant to have a bezelless display unlike the current Z phones which have too many borders. Will they ever release another modules? At $400-$500 it needs a 660. Meh the g6 plus is already $300 and has a larger 3200mah. What's the point of this z play? It will be the best mid-range device for those in the US from Moto since the g6 plus isn't coming to the US. Very solid device and hope the headphone jack is still present. For $500 one should get a Oneplus 5 or 5T instead. Probably better than the Z3 play in most aspects, especially that Sd 835. One of their defining features was actually keeping the home button on front. It was a great reason to switch from Samsung when they removed it. Not the Z has nothing. Seriously i really don't know why Motorola is making so many phones with similar specs? What's the point of making midrange G series play(lite) or plus models when you already have a separate budget(moto E) and upper midrange series (moto X). And even you have a entry level C series plus version, when you had mote E (budget) series up there? And a budget(Moto E) phone series with three versions(moto e,e play, e plus)!! Just launch Moto C(entry level) ,E(Budget) ,G(midrange) ,X(upper midrange) and Z(flagship) that's it. I like moto x force for its battery but they just ruined it with so called moto mod and sleek design with small batteries. Best guess in making all these models, is to just saturate the market, have a phone for everyone, and some aren't sold in the states here.